Yu the Great - A legendary ruler for which no hard evidence of his life actually exists, Yu is considered the founder of the first dynasty in China, the Xia. 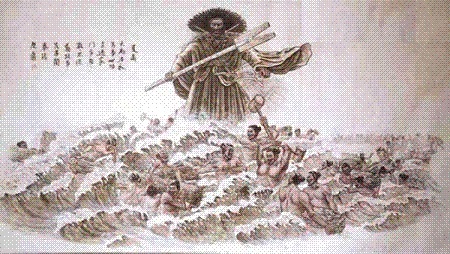 Many oral traditions of him exist, however, and were written down by Sima Qian. Confucius referred to him as a prime example of virtue and nobility. Yu himself is not even the first figure mentioned in Chinese history. That distinction goes to Huang Di, called the Yellow Emperor, who is said to have lived about 2600 BC. Yu is thought to be the 8th great-grandson of Huang Di. And Yu's father, Gun, was considered a demigod who stole the secret of Xirang (a piece of magical earth that can replicate itself and halt floods) from the gods. Gun passed this secret on to his son, Yu.